Having climbed into the dawn sky at daybreak, the Spitfires of No 603 Squadron have already been in action, and with more heavy raids on the plotters table, they scurry back to Biggin Hill to re-arm and refuel. A Messerschmitt Me109, shot down during the previous day¹s fighting, lies discarded in a hay field, its lucky pilot having escaped with his life. Meanwhile, the beautiful Kent countryside comes awake as it prepares for the toils of another glorious summer's day. 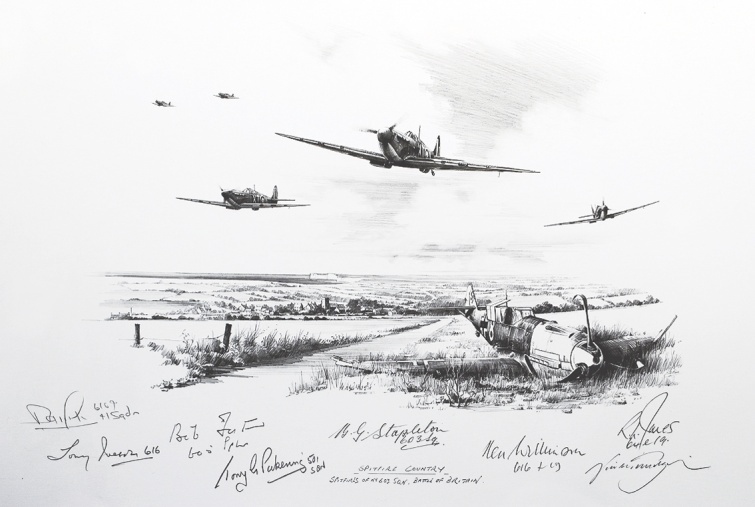 Signed by Cyril Bamberger, Tony Iveson, Bob Foster, Tony Pickering, Basil Stapleton, Ken Wilkinson and Richard Jones. The original illustration is signed in pencil by Nicolas Trudgian and is issued with an original certificate of authenticity.